Friday, 10.35am: Nicky Brett from Yaxley eased through to the quarter-finals of the World Indoor Singles Championship with a straight sets win in the second round at Potters Leisure Centre, Norfolk. Brett, a plumber by trade, will play his quarter-final today (23 January). In the first round, number four seed Brett also won in straight sets - 12-5, 11-7 - against Andy McLean. Brett lost in the semi-finals of the mens’ pairs event - a title he won last year with Ely Bowls Club team-mate Greg Harlow - and in the quarter-finals of the mixed doubles with Rebecca Field. Peterborough’s Howard Shipp, Nick Wilkie and Jeff Newson are through to the last 32 in the English men’s Over 50 triples competition. They took the area honours with a 14-13 victory over Steve Jacobs (Cambridge Chesterton) and now need to win one more game to qualify for the national finals at Nottingham at the end of March. There was no joy though for Joe Randall, Brian Martin and Neil Wright in the area semi-finals of the national triples, where they were beaten 23-4 by England’s Greg Harlow, who also had fellow international Nicky Brett in the team. Carol Hunter’s team missed out on a place in the last 32 of the women’s over 60 triples when they were beaten 19-9 by Jane Baldwin (Huntingdon). Meanwhile the Peterborough men’s team had their hopes of a Denny Plate quarter-final place dashed by Norwich-based County Arts who won the last 16 tie 88-77. Stamford have made it through to the last eight with a two-shot win against Harrogate, but Spalding were beaten in the mainstream Denny Cup by Cumbria. The Peterborough men’s senior team recovered from their previous week’s cup setback by winning 65-62 at Cambridge Chesterton B in the Cambs League. Les Sharp, Ivor Jackson, Richard Day, Don Sutton lost 17-19. Martin Hawkes, Jeff Clipston, Mick Greaves, Frank Paul lost 9-17. Dave Smith, Richard Harrison, Pete Harvey, Wilf Redhead won 22-15. Norman Gray, Don Paul, Phil Afford, Joe Martin won 17-11. Following their defeat of defending champions Lincs at Stamford earlier this month, the Northants Bowling Federation team return to Derbyshire Trophy action on Sunday away to North Cambs at Wisbech. 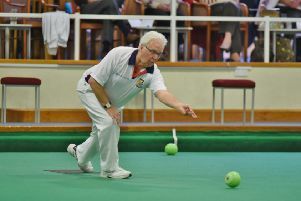 Without any nominations for the posts of senior vice-president and junior vice-president, Huntingdonshire Bowls decided at their annual meeting to appoint for the first time a chairperson from next year. The chairperson will be elected at next year’s annual meeting to serve a three-year term to help with the continuity of the county administration and chair the various meetings. This post, together with a job description, will be circulated to all clubs at the Autumn council meeting of delegates. In the meantime, Alan Parish (Somersham) will be undertaking presidential duties this year, having received the chain of office from outgoing president Dina Barlow (St Ives). It was reported that the new format for the under 18 mixed singles competition had attracted 18 entries, and there had been a considerable increase in other competition entries this year. Elected officers: Association secretary, Freda Thomas; Assistant association secretary, Angie Morton; Treasurer, Keith Thomas; Competition secretaries, Bob & Angie Morton; assistants, Nicky Brett and Freda Thomas; Match secretaries, Dina Barlow & Bob Morton; men’s assistant, Ray Keating.